Illustration by Angela Werneke, courtesy of “Medicine Cards” by Jamie Sams and David Carson. “Little Swan flew through the Dreamtime, looking for the future. She rested for a moment in the coolness of the pond, looking for a way to find the entry point to the future. This was a moment of confusion for the Swan, as she knew that she had happened into the Dreamtime by accident. This was her first flight alone and she was a bit concerned by the Dreamtime landscape. Swan was not so sure that she wanted to enter the black hole. She asked Dragonfly what was necessary for her to earn entry. Dragonfly replied, ‘You must be willing to accept whatever the future holds as it is presented, without trying to change Great Spirit’s plan.’ Swan looked at her ugly little duckling body and then answered, ‘I will be happy to abide by Great Spirit’s plan. I won’t fight the currents of the black hole. I will surrender to the flow of the spiral and trust what I am shown.’ Dragonfly was very happy with Swan’s answer and began to spin the magic to break the pond’s illusion. Suddenly, Swan was engulfed by a whirlpool in the center of the pond. Swan reappeared many days later, but now she was grateful and white and long-necked. Dragonfly was stunned! ‘Swan, what happened to you!’ he exclaimed. 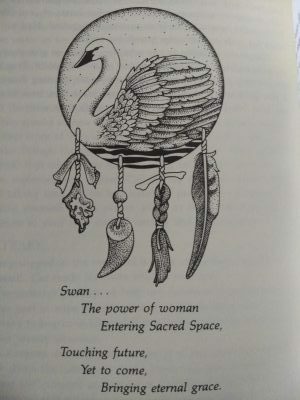 Swan smiled and said, ‘Dragonfly, I learned to surrender my body to the power of Great Spirit and was taken to where the future lives. I saw many wonders high on Sacred Mountain and because of my faith and my acceptance I have been changed. I have learned to accept the state of grace.’ Dragonfly was very happy for Swan.